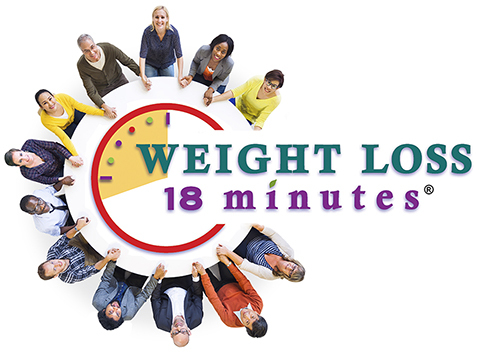 We named this program Weight Loss 18 Minutes because it takes about 18 minutes a day to use the primary tools. Our program is not a “diet” — it is designed to create a “healthy lifestyle” that provides long-term results. 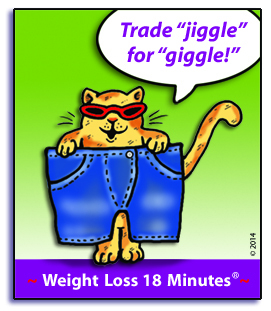 Weight Loss 18 Minutes will show you how to break emotional eating cycles — that include “grabbing and gulping” — so you can OUTSMART unhealthy cravings and feel EMPOWERED! Confidence — that you CAN reach your GOALS! “Trina, thank you for giving me these life-changing tools! Weight Loss 18 Minutes gave me the support and the safe, non-judgmental GROUP environment that I needed to get solidly on track. The diagram below explains what makes our program different from other weight loss programs. 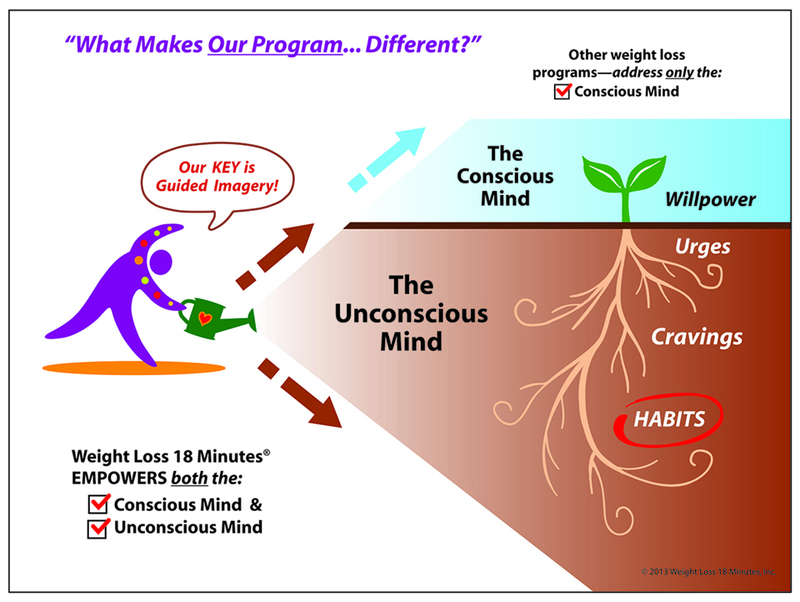 As you can see, guided imagery addresses “urges” and unhealthy overeating HABITS below the surface — often getting to the ROOT of the problem. 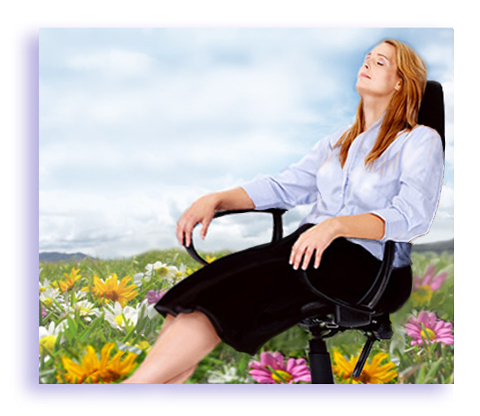 Here’s more good news, while listening to our guided imagery audios you’ll have an opportunity to take a short, RELAXING break — a delicious 10 to 12 minute “mini-vacation!” Ahhh… letting go of tensions of the mind and body release stress. And, according to a Kaiser Permanente research study,* lower stress was significantly associated with GREATER weight loss. 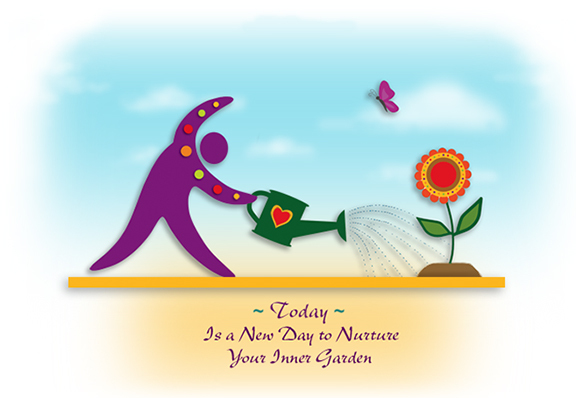 In addition to receiving our relaxing guided imagery audios, you’ll also get inspiring educational handouts. And, just so you know, ALL of our nutritional handouts have been approved by a savvy, Registered Dietician Consultant. Prior to entering the holistic health field and going into private practice, our founder, Trina Swerdlow (“Coach Trina”) received her Bachelor in Fine Arts from Art Center College of Design. After graduating, she was a successful Art Director and “Character Creator” in the greeting card industry. She created numerous characters, which appeared on products that were distributed internationally. “NIP” those unhealthy cravings in the bud! “I appreciate the creative, fun sides of this program. * Kaiser Permanente Center for Health Research, Portland, Oregon. Elder C R, et.al. (2012). Impact of sleep, screen time, depression and stress on weight change in the intensive weight loss phase of the LIFE study. International Journal of Obesity, 36: 86-92.